A parliamentary report of 1777 recorded a parish workhouse in operation at Laugharne with accommodation for up to six inmates. County of Carmarthen: Abergwilly (2), Abernant, Carmarthen (4), Conwil-in-Elfet, Laugharne, Laugharne township, Llanarthney, Llandawk [Llandawke], Llanddarog, Llandefeilog, Llandilo-Abercowin, Llandowror, Llanvihangel-Abercowin, Llangain, Llangendeirne, Llangynnin, Llangunnock, Llangynon, Llanllawddog, Llanpumpsaint, Llansadurnen, Llanstephan, Merthyr, Mydrim, Newchurch, St Clears, St Ishmaels, Treleach-ar-Bettws. Later Additions: Castle Green, Llangunnor. The population falling within the union at the 1831 census had been 35,944 with parishes ranging in size from Llandawk (population 19) to Carmarthen itself (9,995). The average annual poor-rate expenditure for the period 1833-35 had been £14,283 or 7s.11d. per head. The Carmarthen Union workhouse for 140 inmates was erected in 1837 at the west side of Penlan Road to the north of Carmarthen. It was based on a relatively uncommon double-courtyard layout, with separate blocks to the east, south and west. The architect is believed to have been George Morgan, who designed many religious and public buildings in Wales. The workhouse location and layout are shown on the 1906 map below. On the 19th June, 1843, the workhouse was stormed by the "Rebecca Rioters" who, in 1842-43, carried out a campaign of protests across South Wales, mainly against the high charges at the toll-gates on the public roads. The rioters took their name from the Book of Genesis (Chapter 24, Verse 60): "And they blessed Rebekah and said unto her, Thou art our sister, be thou the mother of thousands of millions, and let thy seed possess the gate of those which hate them." The rioters often included one or more "Rebecca" figures dressed in women's clothes and wearing a wig of ringlets. On the day in question, protestors entered Carmarthen to lay their grievances before magistrates. However, possibly diverted by local unruly elements, a large crowd arrived at the workhouse where the master was forced to hand over his keys. The mob then rushed into the courtyard and then entered the buildings where they smashed furniture and broke windows. The riot continued until the arrival of the 4th Light Dragoons who brought proceedings until control and took sixty prisoners. The main block was rebuilt in 1907 at a cost of around £9,000. The new building was three storeys high with a T-shaped layout. 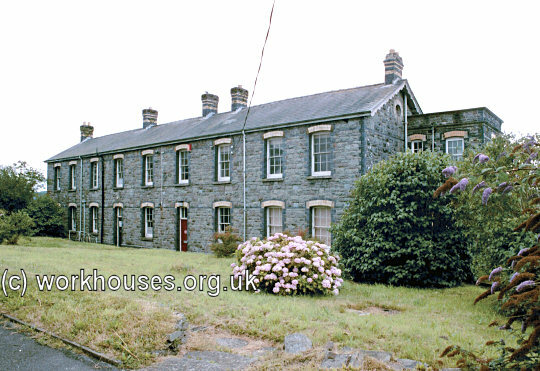 Carmarthen workhouse general view from the north-east, 2000. A two-storey entrance block containing an entrance archway was located at the east of the site on Penlan Road. 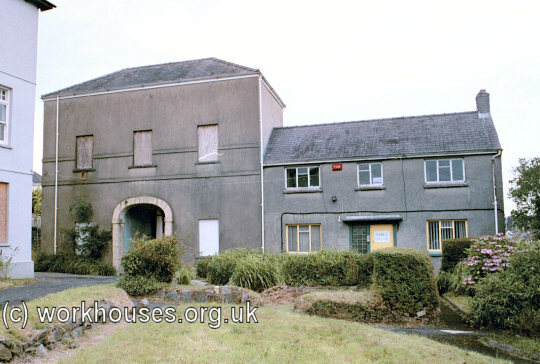 Carmarthen workhouse entrance from the east, 2000. 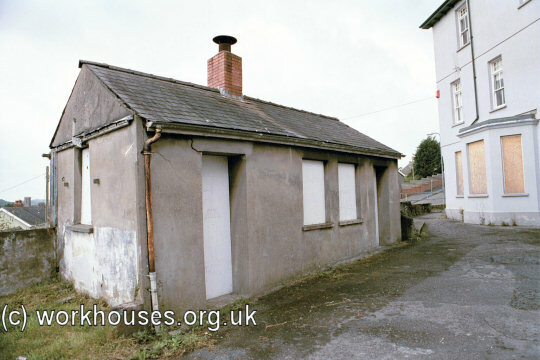 Carmarthen workhouse rear of entrance block from the west, 2000. Carmarthen new main building from the south, 2000. 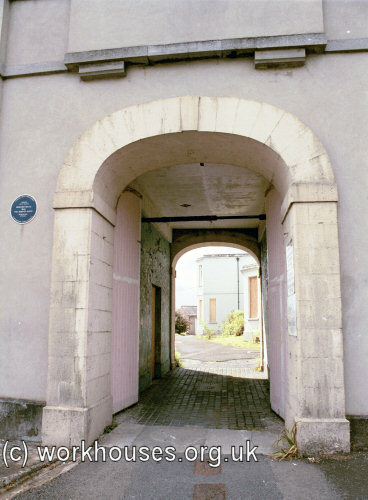 Carmarthen workhouse main building entrance, 2000. 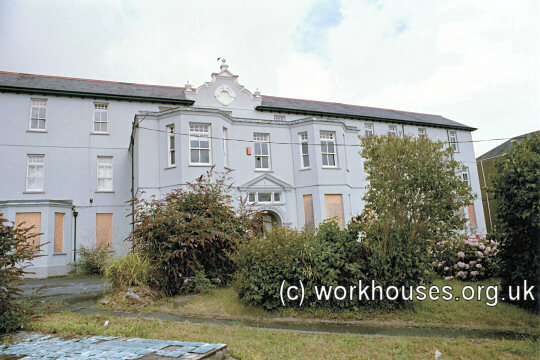 Carmarthen workhouse main building from the south-east, 2000. 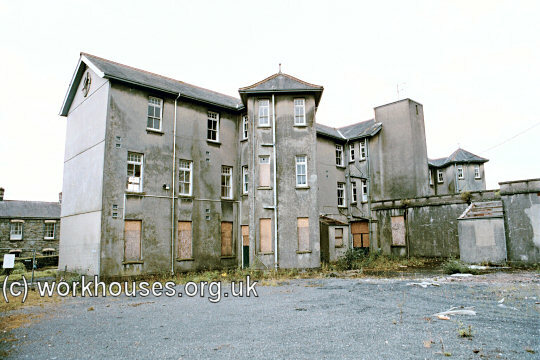 Carmarthen workhouse main building from the north-east, 2000. An infirmary block stood at the sloping southern edge of the site. 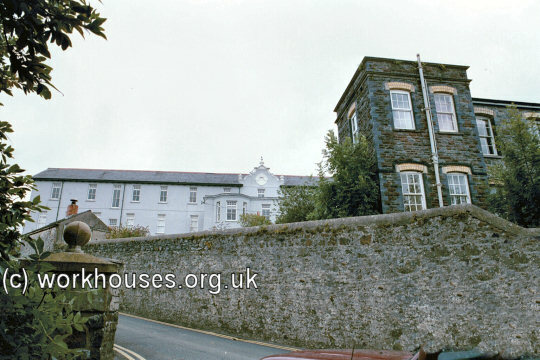 Carmarthen workhouse infirmary block, 2000. A small building nearby was probably an isolation ward for infectious cases. 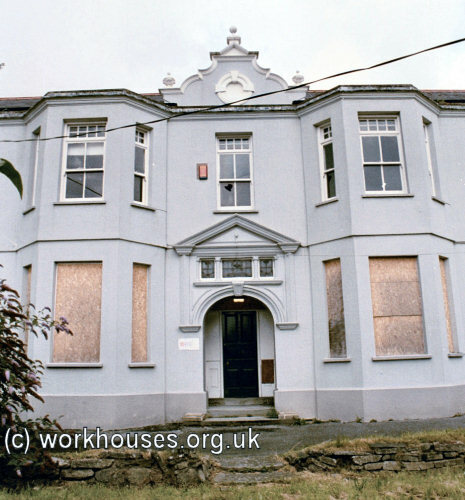 Carmarthen workhouse infectious block, 2000. 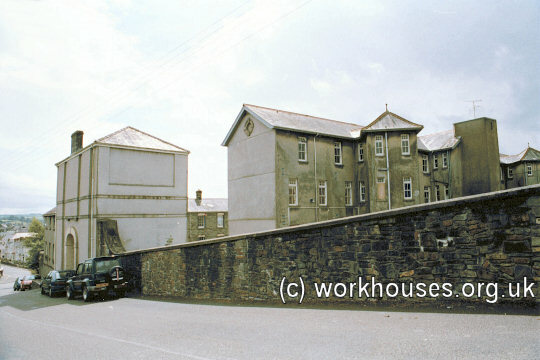 Carmarthen workhouse from the south-west, 2000. From 1904, to protect them from disadvantage in later life, the birth certificates for those born in the workhouse gave its address just as 1 Penlan Road, Carmarthen. During the First World War, the workhouse was used as an Auxiliary Military Red Cross Hospital. Troops were also quartered there during the Second World War. After 1930, the workhouse became a Public Assistance Institution. At some time around then, the main building was modernised with the removal of the east and west ranges, the addition of sanitary towers at the rear of the building, and the remodeling of the entrance. The site later housed the offices of the local education authority. 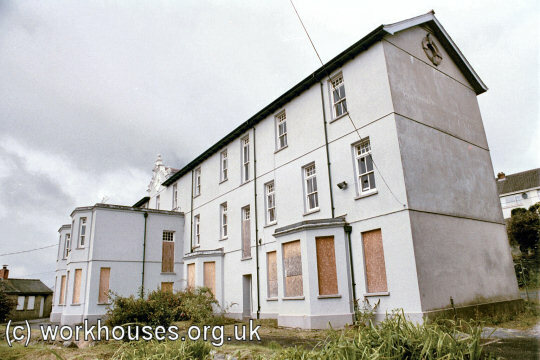 In 2000, a few of the former workhouse buildings were still occupied by charitable organisations, but the majority of the site was becoming derelict. In March 2018, a fire caused significant damage to the surviving infirmary block. By 1920, the Carmarthen Union was running a children's cottage home known as Waterloo Cottage. In 1924, the home could accommodate 15 children, with Jane Evans as its Superintendent. The property, located off Waterloo Terrace to the south of the workhouse, is now known as LLwyn Martin. By 1929, the home had moved to new premises at 'Ystradwrallt' on Station Road, Nantgaredig. 1895 — Master: Edwin Price; Matron: Miss Margaret Price. Carmarthenshire Archives Service, Parc Myrddin, Richmond Terrace, Carmarthen, SA31 1HQ. Sole holdings appear to be: Guardians' minute books (1927-30); Ledgers (1917-30).